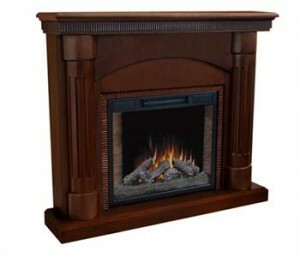 Our Richfield Cherry finish model features a classic raised panel design with contemporary molding detail on the mantel. We have placed this classic design upon our signature hearth for a truly distinctive look. We employ handcrafted construction and the highest quality materials. The heater and flames work independently so the flames can be on without the heat. 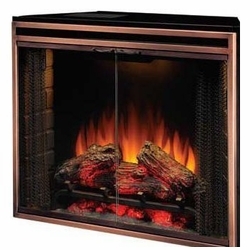 Twin-Star International, Inc warrants that your new ClassicFlame Electric Fireplace is free from manufacturing and material defects for a period of one year from date of purchase. This is subject to the following conditions & limitations. ClassicFlame Service & Support: ClassicFlame offers toll-free technical support should you need assistance. In accordance with their 1-year limited warranty, ClassicFlame will provide you with any necessary replacement parts or accessories. 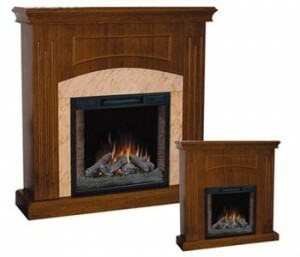 Why ClassicFlame?ClassicFlame Electric Fireplace Mantels have won numerous awards for their design excellence and commitment to using only the finest quality hardwood solids and hand selected furniture hardwood veneers. ClassicFlame Electric Fireplaces offer realistic flame effect with five flame & heat settings. Glowing logs and ember bed look realistic on or off. Thermostat controls room temperature automatically.When you choose ClassicFlame you can be assured you’re getting the finest furniture in the electric fireplace industry. 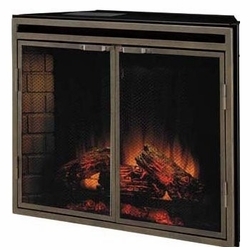 This beautiful, mantel enhancing, front frame is easy to swap out and available for purchase with your new Fire F/X Series 28 Electric Fireplace Insert. 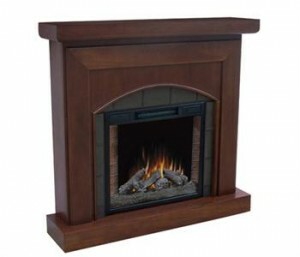 In addition to the classic styling of the mantle features, the firebox insert also has several important features that will be sure to enhance your enjoyment of this product. This easy to use fold down door opens to accept standard air freshener inserts. These inserts, which are widely available at most retail outlets, work in concert with the heater/fan assembly of the firebox insert to add a subtle aroma to your living space. This full function remote control provides a readout of the ambient room temperature and displays the temperature that you set the fireplace to. 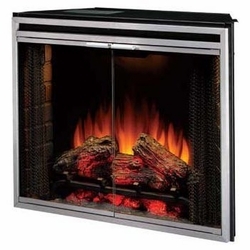 Simply set the desired temperature and the firebox insert will cycle on and off to maintain this temperature. The remote control also includes a convenient on/off button for the integrated LED Highlights ™.The ambiance and heat of your fireplace are now accessible at the touch of a button. There’s truly more than meets the eye behind the subtle and delicate styling of the Carlysle fireplace. Offering a rich medium oak finish and raised moulding details, the Carylsle also has a wild side. Simply remove and turn the inner surround pcs to show off the decorative marble patterning that frames the firebox insert. Now that’s versatility! While the mantle allows you to choose from 2 different looks to best match the decor of your room, the firebox insert is equipped with a few nice surprises of it’s own. There is no venting required, allowing a custom made unit to be constructed against any wall in the home. For the Phoenix fireplace you need to register for the warranty. Click here to Register your Phoenix Fireplace.